When? Wednesday, September 2 at 5 p.m. Eastern. Remember the Virtual Labs only holds 150 people — so make sure you get a seat early. 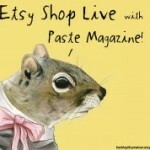 All you’ll need to attend is an Etsy account — register here: etsy.com! Who? Rachael Maddux will be our hostess with the mostess! She is the Assistant Editor at Paste Magazine, where she writes mostly about music and has developed a special knack for sneaking in as many opportunities to browse Etsy for “work purposes” as possible.